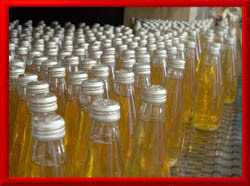 Bottling is a big business! The bottle or jar has proven to be one of the most popular types of rigid packaging around, but once a bottle or a jar is filled it needs to be capped. There are three main types of capping machines, manual cappers, semi-automatic cappers and automatic capping machines. Because most of my work has been on equipment for high-speed production lines I will focus only on the automatic capping machines here. There are three main types in this class. Chuck Cappers, Snap Cappers, and Spindle cappers. Snap cappers are for non-threaded caps and are quite simple. I will cover the other two types of machines in this section, which are used for threaded caps. Both machines are fed caps from a bulk hopper with an orienter near the exit to make sure the caps come into the placement mechanism with to topside facing up, but that is where the similarity ends. Click on the links below to learn more.